HE‘EIA, HAWAII—The mountains on the windward shores of Oahu, Hawaii, are prone to clouds. On a recent breezy summer day, though, it wasn’t water vapor that filled the air, but smoke. The mangroves were aflame. Local farmers were burning the invasive species to make room for taro, a native crop Hawaiians have grown since ancient times. The root vegetable is more than a coloring for your purple milky bubble tea. For the Native Hawaiians who’ve learned to cultivate more than 300 varieties of the plant, it’s a cultural touchstone. Many of their creation stories stem from taro. Today, rice paddies and sugar fields have largely replaced taro patches in Hawaii, but it’s making a serious comeback in He‘eia north of Honolulu. Since 2017, Native Hawaiians have been restoring taro patches, also known as lo‘i kalo, as part of a federally-designated estuarine research reserve with the National Oceanic and Atmospheric Administration (NOAA). Through this partnership between government, community groups, and academia, participants hope to revive an ancient sustainable land management system to improve the region’s water quality. But if the project proves successful, it would do more than that. It would demonstrate that traditional knowledge can help tackle some of Hawaii’s most pressing environmental challenges, from collapsing coral reefs to invasive species. Traditional knowledge is slowly finding its way into academia, especially as our deteriorating environment drives scientists to seek out new sources of information. Turns out, lots of solutions have been here all along even if western science has largely ignored them. This taro restoration project is the first of 29 sites in NOAA’s National Estuarine Research Reserve program—which focuses on protecting the ecosystems where freshwater meets saltwater—to integrate Native management practices to more modern ecological restoration efforts. The management practice being revived in the 1,385-acre He’eia National Estuarine Research Reserve in He‘eia is that of the ahupua‘a. Sections of land managed according to this ancient model include everything from the mountains above to the ocean below—the idea being that everything connected by the flow of water should be treated as a single system. The Hawaiian islands used to be full of ahupua‘a that local konohiki, or overseers appointed by a chief, would manage with the help of luna, supervisors who specialize in various things. But the ancient system got lost amid development and colonization. 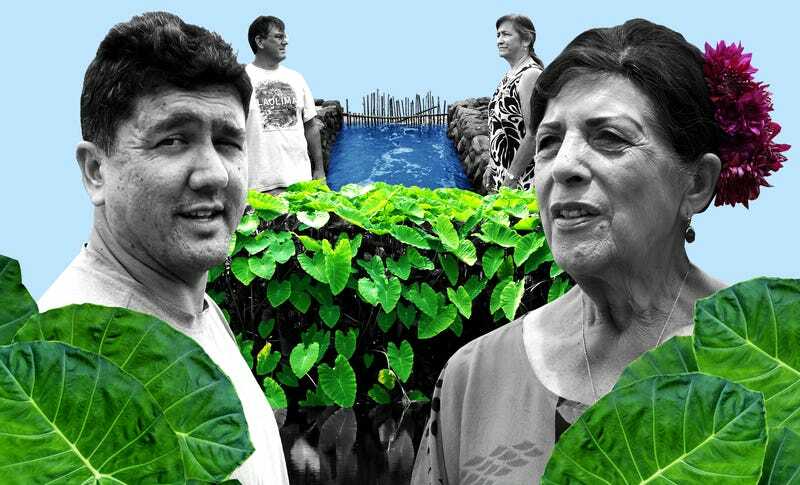 In the piece of the traditional He‘eia ahupua‘a where the new research venture focuses, taro patches play a key role. The research partners—which include the Hawai‘i Institute for Marine Biology and the Native Hawaiian cultural preservation nonprofit Kako‘o ‘Ōiwi—ultimately, aim to improve the region’s water quality, which has been degraded by runoff and urbanization. History suggests that this inconspicuous tuber is up to the job of both trapping sediment and removing pollutants. Centuries ago, Hawaiian taro farmers weren’t worried about pollution, per se. They grew the plant in wetlands in the valleys for food. It was clear, however, that something was keeping the water pristine to the point of intensifying food production, according to one scholar’s account. After some baseline water quality data is collected, the team will work with the University of Hawaii to figure out how to integrate this ancient model with more modern restoration methods, which would involve planting all types of native species (not just taro), in terms of its effects on water quality. Some of the taro patches. The taro is being grown in a 240-acre wetland less than a mile upstream from an 800-year-old, 88-acre fish pond. Restoring the taro patches and the fish pond—which has a long way to go before its mullet and moi fish populations recover to produce the 300 to 500 annual pounds of fish per acre it’s estimated to have in the 1800s—would re-establish two food sources that were once a key part of the Hawaiian diet. The idea is to donate much of this food to locals. Right now, about 85 percent of Hawaii’s food is imported, per the state’s Department of Agriculture, and that’s unsustainable. Ultimately, the water coming downstream from the mountains that filters through the taro and enters the pond would flow into the coral reefs that dot the lustrous turquoise waters of Kaneohe Bay. Reefs have been suffering worldwide from warming waters, pollution, rising acidity and rising sea levels, and those in Kaneohe Bay are no different. The region saw severe pollution in the ’60s and ’70s, followed by heat-driven bleaching events more recently. A 2015 bleaching event affected nearly half the corals in Kaneohe Bay, according to one study. The state recently took action to protect coral across the islands by banning sunscreen that contains coral-damaging chemicals earlier this year. This project is one more attempt to save them—while also saving a culture and way of life. Responsibility, or kuleana, as Cypher described it, is what the ahupua‘a system is all about. She breaks this down for me as we sit in the club’s office munching on some kettle corn. Taking responsibility involves addressing a place’s history—and all the problems people have historically wrought. Like those damn giant mangroves. Sugar companies first brought the non-native trees to the islands in the early 1900s to help maintain soil during heavy rains. They had no idea mangroves would take over the way they have, pushing out local wildlife populations. It’s a story that has played out over and over in Hawaii, which is today infested with thousands of invasive species. The people behind Kako‘o ‘Ōiwi were the ones burning the mangroves when I visited. As we watched the alien trees smolder, the smell of burning wood was oddly comforting. Kanekoa Kukea-Shultz, who runs the nonprofit, pointed out a red-beaked black ’alae ’ula bird (or Hawaiian moorhen) native to Hawaii perched on the charred mangrove remains. Turns out, getting rid of invasive species can invite back native birds that haven’t been seen in a while. Later, Kukea-Shultz drove me, Toonen, Cypher, and Rocky Kaluhiwa, another civic club member wearing bright magenta with a flower in her hair, to where the actual taro patches were. Behind tall rows of huge green taro leaves, the black and white heads of three Hawaiian stilts were visible. Two of these endangered birds were nesting with their youngling near the flooded dirt mounds. The hard work of removing invasives has a long way to go, but Kukea-Shultz’s team is moving fast. They began clearing a non-native California grass around 2005 to cultivate taro patches that can reach up to 1,000 square feet. Fast forward 13 years, and they’ve managed to clear entire fields of grass and build roads with recycled material through old mangrove forests, where they plan to restore even more taro patches. The labor never ends: An older gentleman was busy hacking away at some grass to prepare another taro patch for cultivation as we drove through the farm. Twenty-two patches of taro already exist, but the goal is anywhere from 400 to 600, Kukea-Shultz said. One acre of taro can produce 5,000 pounds of produce each harvest, he said. If there’s a pound for every mouth, that’s 5,000 people that acre could feed through meals like poi, a purple paste made from taro root. The farm gives out and sells most of its taro raw, but depending on demand, they take some of the plants to a mill about every other week to turn it into poi for sale. The community is just starting to see the impact of the taro on the water: During the last flood pulse in February, the patches were able to retain two centimeters of sediment, according to Kukea-Shultz. That’s sediment that didn’t make it into the ocean. If it had, this sediment could’ve reached the reefs and prevented sunlight from reaching them. That’s bad news for the corals’ symbiotic algae, which depend on sunlight to make food. “Whatever sediment we can hold on our land, that’s less sediment on our fishpond, less sediment on our reefs, and less sediment going other places,” said Kukea-Shultz. The fish pond has definitely seen improvement since the restoration work began, said Kawelo, the so-called queen of the pond. Its water still isn’t that crispy clear tone its guardians want it to be, but it’s on its way. A view of the fish pond. Guardians, the name used to describe those who take care of the ponds, have historically used whatever resources are around to build the wall around the fishpond. Dead gray coral dot this pond’s wall, telling a story of coral abundance, a history that now feels impossible. Green and white bottles gathered from Kaneohe Bay sit along the wall, too. They paint a story of pollution, loss, and human apathy. Together, the stark contrast of the coral and the trash serves as a reminder of how we’ve replaced wildlife with synthetic rubbish. And yet as bleak as that message may be, the people of He’eia aren’t wallowing in despair. They’re doing something about it. They’re searching for an answer in their collective memory—and they’re using science to back it up. That union of science and culture may just be the secret to bringing back the balance that ahupua‘a created for thousands of years.